Kids pools make you sick? 5 Tips for safer pool visits. 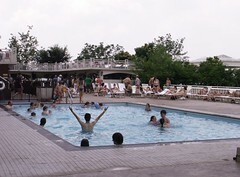 Home » Medical » Kids pools make you sick? 5 Tips for safer pool visits. As reported in today’s New York Times Report on Sanitation at Swimming Pools, out of every eight swimming pools inspected in 2008, one was closed immediately due to serious health code violations according to the CDC (Centers for Disease Control and Prevention). Pools at child care facilities were the most likely to be shut down, with almost one in five closed immediately; the rate at hotels, motels and apartment complexes was one in seven. And, even worse, the report says that kiddie pools that had the worst violations. There are some things you can do to reduce sanitation issues and accompanying sickness, though most really involve you being a better pool citizen. Teach kids not to swallow pool water. Do not allow kids to swim if they have diarrhea. Take your kids on frequent bathroom breaks, even if they say they don’t need to. Yeah, it’s a pain, but it’s the right thing to do. Consider bringing your own test strips to the pool. The inspectors and cleaning crew can’t be there everyday.